What is the brain? Is it biological jello sloshing around in a chemical cocktail? Is it the seat of the soul? Honestly, I didn’t think about any of this until three years ago, because that’s when I had a stroke. Unlike other turning points in my life – leaving home, moving to America, getting married, having kids – nothing was ever as stark as the before and after of having a stroke. But I was lucky. I sometimes joke that the only bad thing to come out of having a stroke was a slightly numb toe and a midlife crisis. This is true, but it’s more than that. It’s as if I sleepwalked into the hospital as a young woman and left shell-shocked and middle-aged. Afterwards, I desperately wanted to start living my life while still in the confines of my old one. Much like that nightmare where you’re being chased by something awful, but you can’t move your legs. I don’t fear death, I know it’s chasing all of us, but I desperately want to live a fuller, more vital life. No more sleepwalking. I would like to say that I had an epiphany and decided there and then to follow my dreams with laser focus. Change the world, be a better person, climb a mountain, be daring and bold. As strange as it seems, part of me wanted to relive that curiously exciting, but fear filled, period of being in the hospital when my life, as I knew it, was held in the balance. The edited version of my life since then is quite impressive – sold my business, returned to school, managed to be a mother to three boys while achieving academic excellence, all with the goal of learning about the brain so that I can help others and make a difference in the world. But that is most definitely the edited version, although not exactly a lie, much of it was built on doubt and anxiety. The truth was that initially I just wanted to have fun, to feel all the feels, and – most importantly – if I got out of the hospital in one piece, I was most definitely getting a convertible. Yes, I eventually got my convertible, but in those first weeks and months, I was mostly compelled to create art. As a creative person who always identified as being “artistic,” I was surprised and a little ashamed that I had not made art in over fifteen years. Much of this initial post-stroke period was taken up obsessively drawing and listening to music loud enough to feel on the inside. Looking back on it now, creating art was the best therapy, allowing me to work through the stickiest part of my existential crisis. Now three years on, my existential crisis is more mindful than paralyzing. Balancing my return to school with being a mother and wife takes precedence over creating art. 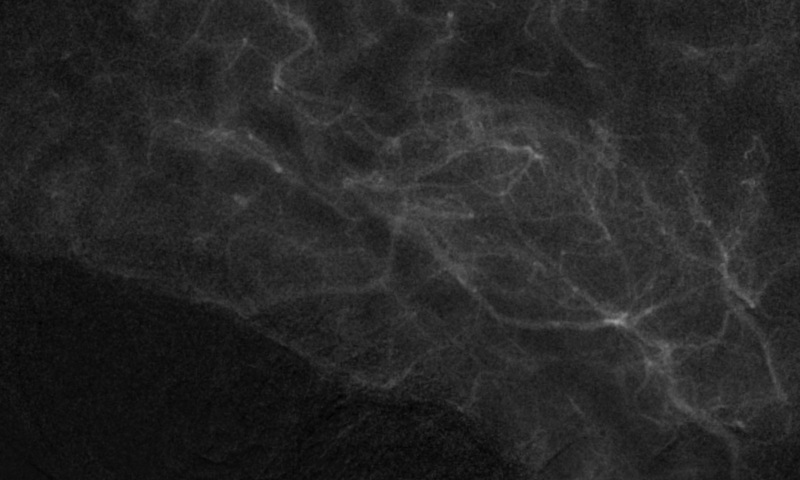 But creativity and art is never too far away and I find it in unexpected places, like science. 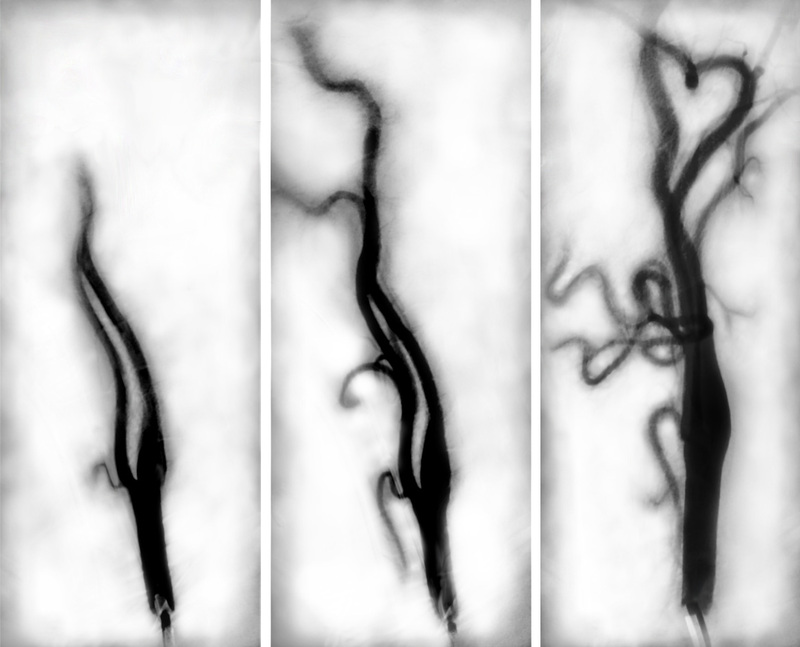 In fact, the monochromatic angiograms that depicted my brain’s blood vessels as they sadly spasmed seemed oddly artistic. Reminiscent of etchings that I loved to create, I found them inspiring. Indeed, these actual images are the basis for the artwork that I created for this piece. In them I see art and science; I see life as it changed. Recently, my neurologist asked me if I’d worked out the brain yet–he knew that I had returned to school to study psychology–the answer is, and will always be, “no.” My curiosity has led me to find answers to questions I never knew I had, but for every question answered a new one takes its place. Our brains lie at the intersection of our bodies and our selves, fueled by experience and environment, people and places. That’s a lot of variables to work with and a multitude of questions to ask. My questions now are what have I learned from my own experience and how can that help others. How can I combine art and science? Will my ideas take shape or will the day-to-day take their place? What I do know is that life will never be the same, because having a stroke was the best-worst thing to happen. It changed my life for the better. Art and science. Life and death. Atoms, cells, organs, individuals, communities, society, and the universe — they’re really all part of a continuum. It’s scary, it’s beautiful, and it’s all we have.